There is an old adage that says "if you do what you've always done, you'll get what you've always got." In other words, change is good. The solution is to find a way to introduce change gently, to incorporate it into our daily lives in a way that makes it as minimally invasive as possible, so that by the time we realize we've made a major change, it's already become a comfortable habit that we've learned to embrace instead of dread. And as with so much else in life these days, there's an app for that. Several in fact, and I've listed some of my favorites here. Use them to introduce some small changes into your day and let the momentum carry you on to bigger and better things. If mindset is truly the key to success, then this little app will help you open that door. Choose how long you want to meditate — 5, 10, 15, or 20 minutes — and then start your day with a guided meditation. You can also choose to add nature sounds and/or music to your meditation, as well as listen to just the music without the voiceover. Available for iPhone, iPad, Blackberry, Windows, and Android devices. I've mentioned this app before, but I'm mentioning it again because it's definitely one you should have in your arsenal of mobile tools. Duolingo is a free app that gives you language lessons and in exchange, you help to translate the World Wide Web (when you're ready of course). Currently they offer French, Spanish, Portuguese, German, and Italian. I'm learning the first three simultaneously (which is a challenge) and absolutely love this app. Each lesson takes 8 to 10 minutes tops, making it easy to work into your schedule. The unique interactive interface almost guarantees that you remember what you've learned. The app is available for iPhone and Android devices, or you can use the web-based interface if you prefer to expand your horizons from your PC. Okay, how many of you had "work out" or "get in shape" on your list of resolutions this year? And now, how many years has that resolution been on your list? The problem with working out is that it's addictive...but you have to actually do it before the addiction kicks in, and getting over that starting hump isn't always easy. Enter the Workout Trainer. This is by far the best workout app I've found to date. There is a pro version, but the free version offers more than enough to get you up and moving on a regular basis. Choose from a variety of workouts, add your favorite music, and you're ready to go. No equipment is needed, detailed instructional videos for each move are included, and you can connect with their workout community or share your progress via email and social media platforms. Available for iPhone, iPad and Android devices. The Nike+ app uses the GPS on your phone (no extra devices or plugins required) to track your workout and show your progress. I've started walking in the morning, taking my dog along with me as part of his leash training. It's a simple app, but effective, and I get excited when I hear the computerized voice tell me that I've reached my goal or when I see that I've knocked two minutes off my time. (Of course, that's probably because my 90-lb dog is pulling me faster than he did the day before.) You can "friend" other Nike+ users and see how you measure up, which is good for those of us who have a competitive nature. And did I mention it's free? Click for iOS or Android here. It's not always easy to make it to the yoga studio on a regular basis or, as in my case, to even find a yoga studio that's nearby. YOGAmazing is the solution to that problem, and you won't need a player or a studio to make it happen. The app includes 50 yoga sessions designed to increase your flexibility and bring a little body-mind-spirit balance. Each session is 25 minutes long, and you can favorite the ones you like best for easy recall. Available for iPhone, iPad and Android. Can't get away for a full yoga session? Then use this app to do some beneficial poses at the office. 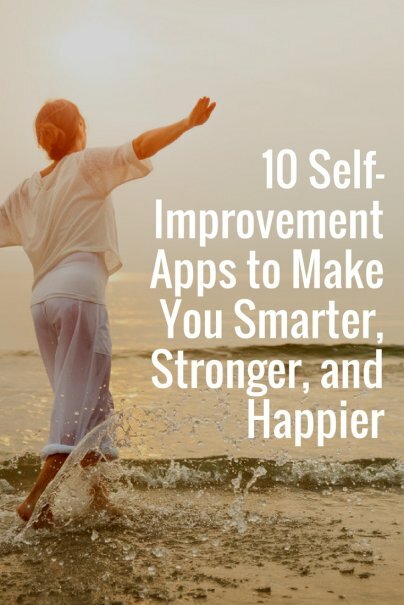 The app includes 75 sessions, organized both by time of day as well as situation, so you'll find stretches you can do while on the phone as well as more invigorating exercises designed for your walk to lunch. Available for iPhone and iPad. I'm sure you've seen commercials for this app by now, but I'm going to list it anyway, just in case. Lumosity is a wonderful collection of brain games designed to test your mental acuity and give your gray matter a serious workout. There is a more comprehensive web-based version, but the app offers a free trial that includes five sessions of three games each and a pro version of the app for $9.99 per year. Even though the app version isn't as robust as the web-based version, it's still well worth the 10 bucks. Use it daily to improve your memory, increase your observation skills, and just generally make yourself smarter. Want to get more in touch with the "real you?" Lifetick offers a goal setting app that doesn't just track your progress, it also helps you establish your core values, i.e., what's really important to you. The result is that your goals become more personalized, and by using the SMART goal-setting method, you can track your way to success. There's also a journal feature and status widgets to help keep you inspired and on track. There's a free version available, and it's $20 a year for the pro version. You can also create a bucket list for your long-term future and you can share your goals with other members for extra motivation. Available for iPhone and Android devices. If you want to start small, this is the app for you. Lift allows you to choose simple habits you'd like to implement — from flossing your teeth to going to bed before midnight — and then you can "check in" every time you perform that task. The app tracks your progress and other users can give you kudos for your follow through to add to your feeling of satisfaction. Available for iPhone right now, but the website promises a web version is on the way — you can sign up for future updates to know when new versions are released. This last one is currently web-based only, but the creators say they're working on a mobile version, and it's just so darn cool, I felt like this list wouldn't be complete without it. Instinct is the new (and fun) way to learn guitar. It uses the built-in microphone on your computer to listen to the notes you play and correct you as you go. It can teach you both songs and riffs, and it also has a tuner to help you find that perfect pitch for each string. It's free and offers a range of lessons to suit both beginners and advanced players. Incidentally, I regularly tweet about my adventure with change and love to cheer others for doing the same, so follow me on Twitter if you'd like to expand your support network, and we'll evolve together. So, there's my list...do you have a favorite app or resource that helps you be all that you can be? I love Lift! I learned about it from a David Allen (GTD) tweet around the start of the year. The home screen of my iPhone shows 6 habits, so I limit myself to those. And every habit I've started to track has become a consistent part of my routine. It's been a great motivator for me to enforce self-accountability. Duolingo's site clearly states that an Android version is not available, but will be on the 29th. My list isn't long like yours. I only have the Manage Money app to track my spending and QuitNow! app for quitting smoking. The second one isn't free but I love the way it tracks my progress. I will be soon a reformed smoker! I love the pic that goes with this post. I laughed out loud. Cute. I can't wait to try these apps. I've been writing down my goals on my blog. I need to incorporate one of these. I really like the free pedometer app. You can measure your steps, calories burned, the time you spent and more. I'm curious to see what Office Yoga is like. It sound manageable. Another one I like is called Habit Streak. You list either bad habits you want to quit or good habits you want to start and you keep track every day until you've mastered or de-mastered the habit. I started using an app called Lose It! around January 1, and so far I've lost 25 pounds. I like it because you choose your own rate of weight loss (for me, slower is much better) and keeps me honest and grounded. It also helps once you've lost the weight, but giving you a calorie amount that will maintain your new lower weight. I love it and recommend it. Great list, I used Duolingo to master Spanish Vocabulary. Another great new iPhone app I've been using for improving the brain is Elevate. 5. Coursera - allow to study online even in subway with cashing.